This accessible guide will be an invaluable resource for early years practitioners looking to make a positive difference in their settings by using action research or teacher enquiry. Guiding readers through the practical steps, issues and potentials of conducting research in a variety of early childhood settings, the book will increase practitioners’ confidence, enabling them to bridge the gap between recognising room for improvements, and instigating necessary changes. 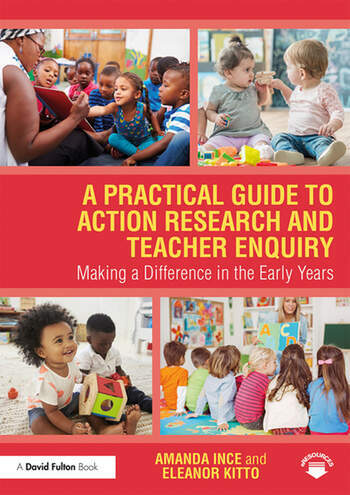 Divided into easy-to-follow sections, A Practical Guide to Action Research and Teacher Enquiry offers clear definitions and explanations of action research along with explanations of how it can be applied in early years settings to effectively and efficiently improve outcomes for children. Chapters outline a clear rationale for engaging in action research, highlight purposes and potentials of various approaches, and provide a helpful step-by-step discussion of the different stages of enquiry. Ten examples of practice are used to clearly illustrate the action research cycle in a variety of settings, and in relation to a range of topics and ages, thereby providing readers with a wealth of tried-and-tested ideas for application in their own settings and projects. These are supported by a range of downloadable resources which can be used as tools to support the planning, reflecting and evaluation of practitioners’ research activities. Informative, inspiring and highly relevant to practice, A Practical Guide to Action Research and Teacher Enquiry will support and scaffold the research activities of early years practitioners, managers, and students. Amanda Ince is Programme Leader for the MA in Early Years Education and the MA in Primary Education programmes at UCL Institute of Education, UK. Eleanor Kitto is Programme Leader for the Early Years Initial Teacher Training programme at UCL Institute of Education, UK.